I had alot of fun creating this birthday card! It features many layers and bright colors, which are two of my favorite elements. I started with the number theme for the Number Challenge at Heart 2 Heart Challenges. I knew I wanted to make a "29th" card....just so I could ink my inside sentiment....which we will get to in a moment. 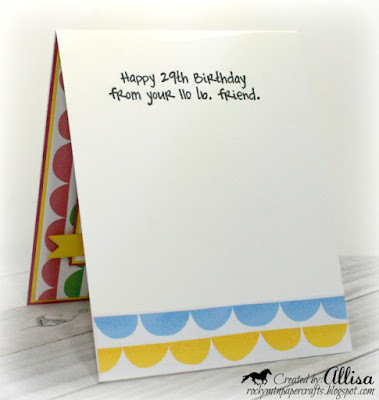 I went with the Something Fierce paper line by Close To My Heart, as the bright colors are perfect for a Birthday Card. I die cut my block number dies six times and layered them together for added depth. The banner die, cuts with it's own dimension. My happy and "th" are from the upcoming April Stamp of the Month, Sweet Love. The"th" is actually part of the thanks sentiment. I just masked it off, so that only the "th" appeared on my card. 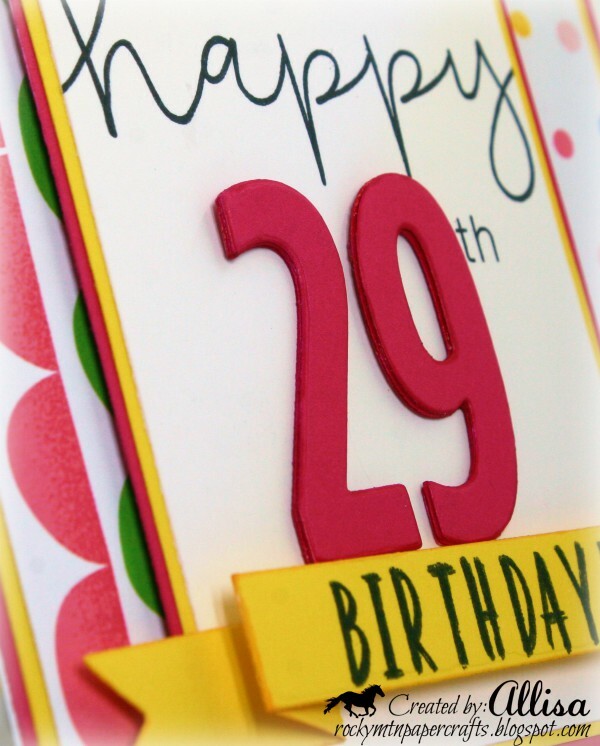 As you might have guessed, the card is not really for a "29" birthday, but you definitely get that when you open to the inside. I am about as close to 110 pounds as most of my friends are to 29! I finished off the inside with a coordinating scrap of banner paper. My card is based on the sketch challenge this week at Sketch Saturday. The challenge this week is to use any sketch from the archives. I went with Sketch #278 and rotated it for my card design. Don't forget tomorrow is the last day to take advantage of The Paper Party! 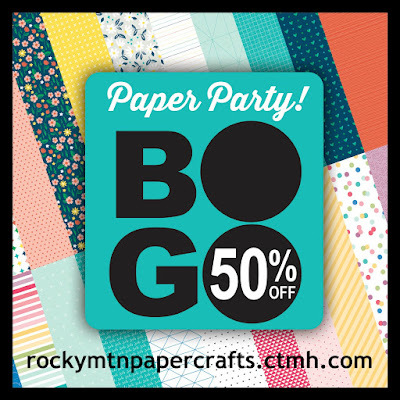 Paper packs are Buy One, Get One Half Off. This also includes coordinating cardstock packs! I loved this post--it made my day! The card is beautiful and the story is priceless!! Ok, before I even start that sentiment on the inside....from your 110lb friend, I just love silly snarky stuff like that, to funny and works so great with the sentiment on the front! I love the colours and the banner on the front and the scallop is a great touch on the inside, I love everything about this card! Thanks for playing along with Heart 2 Heart Challenges (H2H). 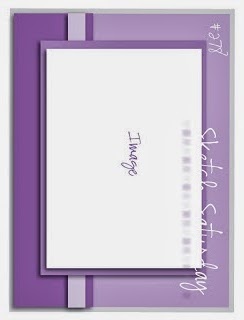 You have such a gift to make even the simplest cards or the papers I am not sure what to do with look absolutely amazing! I just LOVE you card. So so cute. Thank you for playing along with us at Heart 2 Heart. Really cute card, Allison. Love the dimension on the block numbers, and the inside sentiment is great!!! Omg!! What a fantastic birthday card, I love it!! Thank you for joining us at Heart 2 Heart. A wonderfully made fun and Happy card! Love the bold numbers and the bright colors! So happy you played along at Seize the Birthday and I hope you will be back again soon! 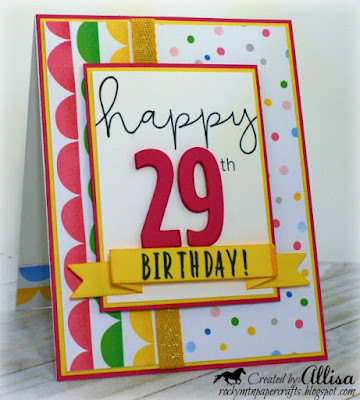 Love the bright and cheerful design of this card! Thanks for playing with us at Heart 2 Heart!